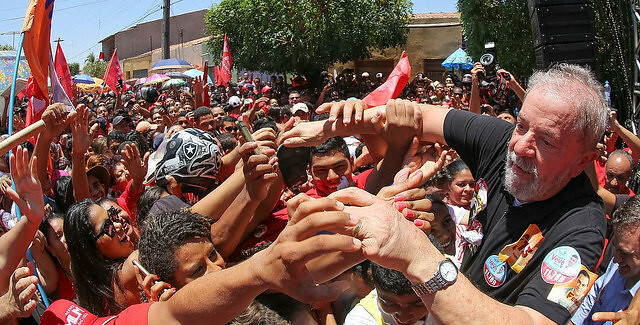 The Workers’ Party presidential pre-candidate Luiz Inácio Lula da Silva is leading a new poll conducted by pollster MDA for the National Confederation of Transport (Confederação Nacional do Transporte – CNT/MDA) on voting intentions for Brazil’s upcoming elections in October. The country’s former president is ahead the second and third places combined by some way. The second place in the poll is far-right candidate Jair Bolsonaro (16.7%), followed by center-right Marina Silva (7.6%). The margin of error is plus or minus 2.2 percentage points. The poll was released on Monday (14). In a scenario where Lula does not run for office, Bolsonaro tops the poll with 18.3% of voting intention, a result that was massively covered up by the mainstream media in Brazil. According to the CNT/MDA, 2,002 people were surveyed in 137 cities in 25 states, in all five regions of the country. Click here to read the full poll in Portuguese.